A quick analysis shows us that it is a dolman sleeve empire sheath. The front view with the wide V-neck and 3/4 sleeve is alluring and modest at the same time. But the profile and back view, mama mia, this dress is pasted on! Now Michelle Obama is no tiny little thing, she is not only statuesque, but full figured. It is amazing how wonderful she looks. I have to go thru my vintage patterns and see what I have that comes close to this dress. I waaaahnt one! 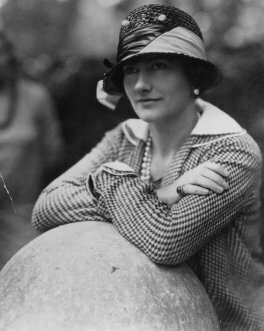 125 years ago today, in a small town in rural France, Gabrielle Bonheur Chanel was born to unmarried peasants. Her mother died when she was 12, and her vagabond father was unable to support his five children. Gabrielle was sent with her sister to an orphanage, where she larned to sew. Eventually, around 1910, when she was in her late 20’s, with financial backing from her wealthy lover, she opened a hat shop on Rue Cambon in Paris. And the rest is history. The Boston Globe ran a story today in the Business section about a sucessful class action lawsuit against Federated Department Stores and high end brands such as Chanel, Dior, Calvin Klein, etc. 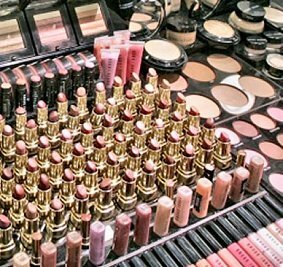 Evidently, Federated and major cosmetics companies violated anti-trust laws by colluding on promotions (among other things) and this amounted to price-fixing. You can register on the class action website for an email notification for the distribution date of the free makeup. This is scheduled to happen in January 2009. Darn right I signed up. TLo over on Project RunGay did a post recently about Ralph Lauren’s design for the US Olympic Team. Just my opinion here, but how many ways can you spell b-o-r-i-n-g? Honestly, those outfits made elite athletes look like trust fund schmoes straight from the Ryder Cup circa 1930. Ascots? Striped rep ties? Blazers? With that dopey crest on the front? White golf caps? In 2008? ? The true fashion statement of this Olympics is the Speedo LZR Racer, designed with input from Comme des Garcons. This is one stunningly beautiful piece of performance clothing; the fabric is a proprietary textile that actually reduces drag on the swimmers body by minimizing skin vibration and muscle oscillation. The seams are not sewn but bonded by a micro-laser and the suit also has an inner core stabilzer that supports the body in key areas to help maintin a proper body position in the water. Just watch the underwater footage of Michael Phelps – no drag, no turbulence, sleek as a shark. AND its great fashion.